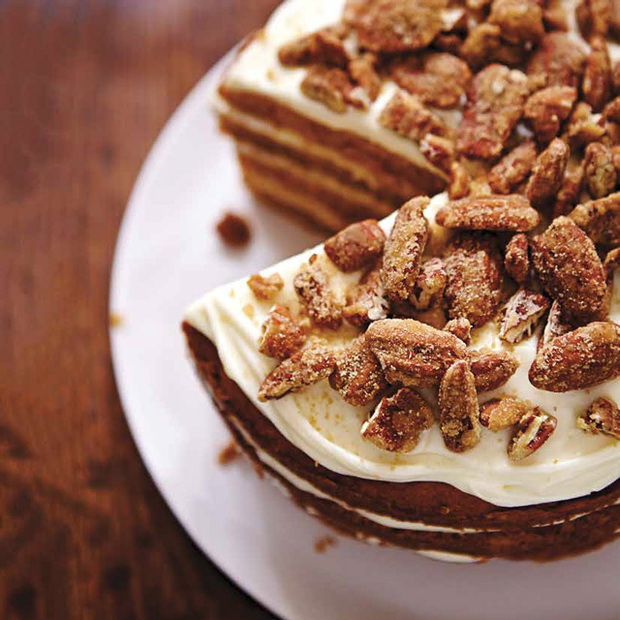 Pumpkin Spiced Cake | HELLO! To make the cake, with the rack in the middle position, preheat the oven to 350° F. Butter and line two 8-inch springform pans with parchment paper. In a bowl, combine the flour, baking powder, baking soda and spices. Set aside. In another bowl, cream the butter and sugar with an electric mixer. Add the eggs one at a time, beating until smooth. Add the pumpkin purée and beat until incorporated. With a wooden spoon, add the dry ingredients. Spread the batter evenly between the prepared pans. Bake for about 30 minutes or until a toothpick inserted in the centre of the cakes comes out clean. Let cool for 10 minutes. Unmould and let cool completely. To make the frosting, in a bowl, using an electric mixer, beat the cream cheese with the butter and icing sugar until smooth. Drizzle in the chocolate, beating constantly. If it’s too soft, refrigerate for 15 minutes before frosting the cake. With a serrated knife, slice each cake horizonally, to make a total of four layers. Spread one cut surface with one quarter of the frosting. Repeat steps with remaining layers. Optional To garnish with candied pecans, bring ½ cup brown sugar and 1 tbsp water to a boil in a saucepan over medium-high heat. Add 1 cup pecans halves, lightly toasted. Stir constantly with a wooden spoon until the sugar crystallizes and coats pecans. Cool on parchment paper. For more delicious Ricardo Larrivée recipes, go to ricardocuisine.com.